Air hissed through the AeroPress at 35,000 feet and filled my cup with Bare’s Bondi Beach coffee. My business partner, Brandon Warman, and I were aboard a plane headed for Hong Kong to meet our manufacturing team and represent our company, Handground, at the Hong Kong Housewares Tradeshow. Our plan was to tackle manufacturing head-on while getting the chance to explore coffee in Thailand between manufacturing milestones. Four months earlier Brandon and I embarked on a mission to build a new coffee grinder called Handground. We rented out our bedrooms on Airbnb to cover rent while working day and night from our garage in Santa Barbara to bring the idea to life. Throughout the process, we posted our progress online to solicit feedback, and eventually built a following that would come to be known as Team Handground. This team, now composed of thousands of coffee enthusiasts around the world, has helped us make vital decisions that have shaped the design of Handground. The following week we were standing on the tradeshow floor in Hong Kong with our manufacturing partner, Platform88. The latest prototype was on display and we met with distributors from around the world. During our first in-person engineering review it quickly became clear that this trip around the world was worth it. Our entire team spent the day tearing apart the design piece by piece, pulling out calipers to debate over a millimeter and wage battle between design and engineering - all with an underlying focus on improving function and longevity. With the next milestone set, we left for Thailand where we heard coffee was alive and thriving. As the plane descended towards Chiang Mai the flight attendant pointed to me to shut off my iPhone. I began to flip through the airline magazine when the headline “Magic Beans” caught my eye. I read the words, “Chiang Mai, arguably the kingdom’s coffee capital,” and as I gaped at pictures of red coffee cherry and brightly colored cafés, that excited feeling of being in the right place at the right time started to build. The sound of wheels screeching on the landing strip prompted me to read faster as a story of coffee being used as a tool for war and survival unfolded. In the 1970s, the King of Thailand set forth a royal decree to end the opium trade and gave the hill tribes coffee seedlings. This introduced a new way of life for people in the remote mountain villages north of Chiang Mai, known as the golden triangle. This is where we were heading. Ancient walls form a perfect square that defines the heart of Chiang Mai. The area inside is known as Old Town and is filled with the nonstop traffic of life. 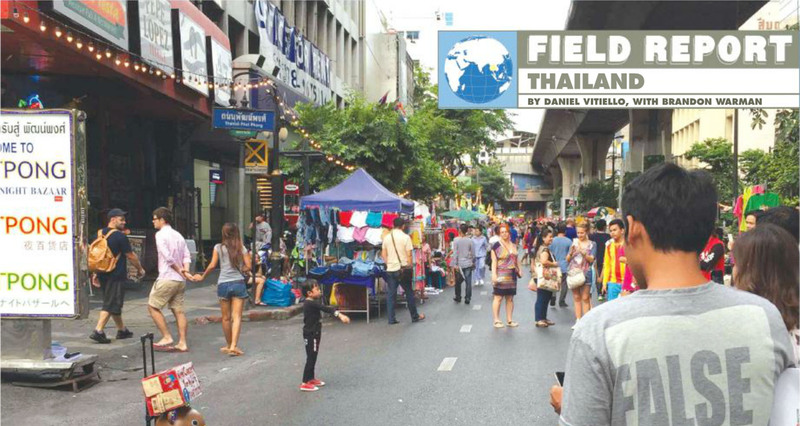 The Night Bazaar is one of the most expansive outdoor markets in the world, with stall after stall selling T-shirts and Thai dresses embroidered in repetition with the classic symbol of Thailand, the elephant. If you look past the stalls you’ll notice there’s one more thing that fills this city from corner to corner: coffee shops. Since we were working from the road, wifi speed interested us almost as much as cup quality. The better part of the next few days was spent writing backer updates and answering emails while sampling coffee all over the city. Here’s a recap of our favorite three shops in Chiang Mai. • Woo Café recently opened as a cafe, art gallery and lifestyle shop located east of Old Town. A relaxing atmosphere is promoted by bright green plants decorating every surface and sweets showcased under glass domes on the espresso bar counter. There is no drip coffee but the espresso is well crafted and served on wooden trays with a butterscotch cookie. • Akha Ama has been famous for working with local farms to enhance the quality of coffee over the last 8 years. Hidden from the street by a wall of vegetation, the cafe features a pourover bar and coffee memorabilia from Intelligentsia, Ritual and other international specialty coffee brands. I ordered the Ponlamai blend on drip and smiled proudly as I saw the barista reach for a hand grinder. The cup produced a taste of sweet stone fruit with a black tea like finish. • Ristr8to can be summed up in two words, latte art. The passion of their championship winning baristas show through every aspect of the cafe. The menu goes into detail about the differences in tasting profiles based on origin and roasting. The wooden serving platters are laser etched with a description of the blend’s tasting notes and composition. However, none of this surpasses the stunning latte art which is poured in every drink served. One morning, we rose early and climbed into a rented silver pickup truck with a huge bed topper. “Imagine how many bags of coffee we could fit in there!” Brandon said. This was the day we had been so eagerly awaiting: We were going to visit our first coffee farm. We headed north on a four-hour journey through windy dirt roads and mountain passes to Doi Chaang coffee farm. In Thailand everyone drives on the left side of the road. Inside the car, the steering wheel is located on the right and all the controls are reversed—including the gear shifter and turn signal—from what I was used to back home in the States. I found myself repeatedly turning on the windshield wipers rather than the turn signal. “It feels like I’m wearing my pants backwards,” I said to Brandon. Brandon began questioning me about how to drive a stick shift and I explained the basics to him. Once he had a grasp on the fundamental workings of the clutch and shift pattern on the transmission, he said, “Can I try to drive?” I pulled the truck to the side of the road and we did a Chinese fire drill. Within minutes Brandon was shifting through gears while driving on the left side of the road. With Brandon at the helm, we sailed down the highway until we spotted a sign that read “coffee” and decided to turn off the main road and begin our ascent up the mountainside. It became clear that this landscape had been shaped for agriculture. Dark brown slopes broke up orderly green plots of vegetation that covered the hillsides. As we climbed up the mountain we began to spot nurseries with long black nets creating a canopy for coffee seedlings, and at 4,000 feet in elevation the village of Doi Chaang came into view. In the 1970s farmers here were taken advantage of by exporters who underpaid them. 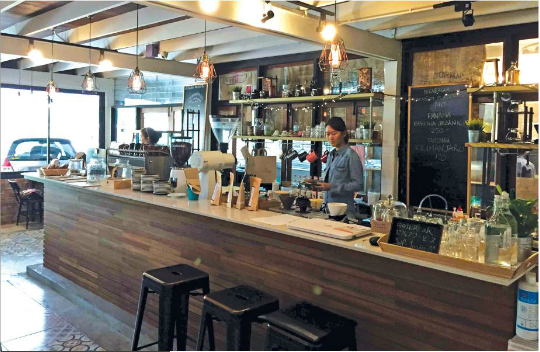 It wasn’t until the Canadian entrepreneur John Darch left the mining industry and entered the Thai coffee scene that things changed. John saw an opportunity to export the coffee that was being grown in Thailand. He partnered with Doi Chaang with the mission of giving the coffee farmers a fair price for their crop, and importing the coffee to roasters in Canada. They formed a direct partnership where the farmers held a 50-percent stake in the company. 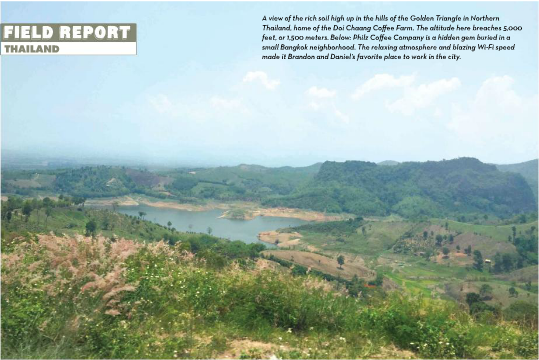 Over the next 20 years, Doi Chaang would become the face of Thailand coffee to the outside world. Brandon pulled the truck into a gravel parking lot, and the diesel engine stuttered to a halt in front of the coffee shop Doi Chaang has set up right by the processing facilities. With wooden panels for a floor and no walls, the café felt more like a patio overlooking a rural hillside. At first glance, it appeared deserted but then a tattooed barista with a cut-off British flag shirt emerged. He pulled two shots of espresso as we soaked in the views and made conversation with a girl named Minso, whose father exports some of the farm’s coffee to South Korea. She offered to take us around the farm and show us the processing facilities. We followed Minso up a steep dirt path to a stack of machinery used for de-pulping the cherries. The machine was fed by deep, wide troughs lined with sky blue tiles pressed into the concrete like patchwork. Although this is usually where the wet process takes place, it serves another purpose during off-season. There was a group of kids splashing around in the troughs and laughing. It was a pool party! After laughing and trying not to get the camera wet, we went on to the giant drying patio followed by a warehouse where the coffee is sorted and bagged for shipping. Coffee grew everywhere around us as we walked around the farm. In Thailand, 95 percent of coffee grown is a hybrid, rust-resistant, high yield Catimor varietal. After the tour we decided to get back in the truck to get an idea of how big this place really was. With the truck in low gear, we crept down a single-lane dirt road into the heart of the village below. There were people lounging on bamboo platforms or sitting in small groups outside of their homes, but overall there wasn’t much activity. The sunlight began to fade and so we began the 4-hour journey back to Chiang Mai. We would have loved to stay for more than one day but we needed to get back to a place with good internet. Handground wasn’t going to build itself! Almost everyone has heard of Bangkok, but not because of its coffee. The temperature in the summer can rise as high as 100 degrees Fahrenheit. Add 80-percent humidity and you begin to realize why iced coffee and tea are the go-to drinks in the city. A traditional Thai iced coffee starts with a shot of espresso, followed by a large scoop of sugar, half a can of condensed coconut milk, and topped off with a whole lot of ice. 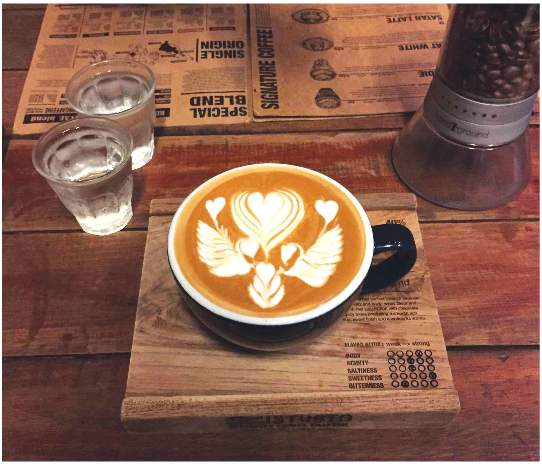 After posting on Instagram that we were heading to Bangkok, a member of Team Handground named Gary sent us an email with a list of his favorite cafés and a claim that the specialty-coffee scene in Bangkok was even bigger than it was in Chiang Mai. A feeling a serendipity swept over me when I saw that Kaizen Coffee was the first shop on Gary’s list. Brandon and I started applying the Kaizen philosophy of continuous improvement in our lives even before we had the idea to build a new coffee grinder. 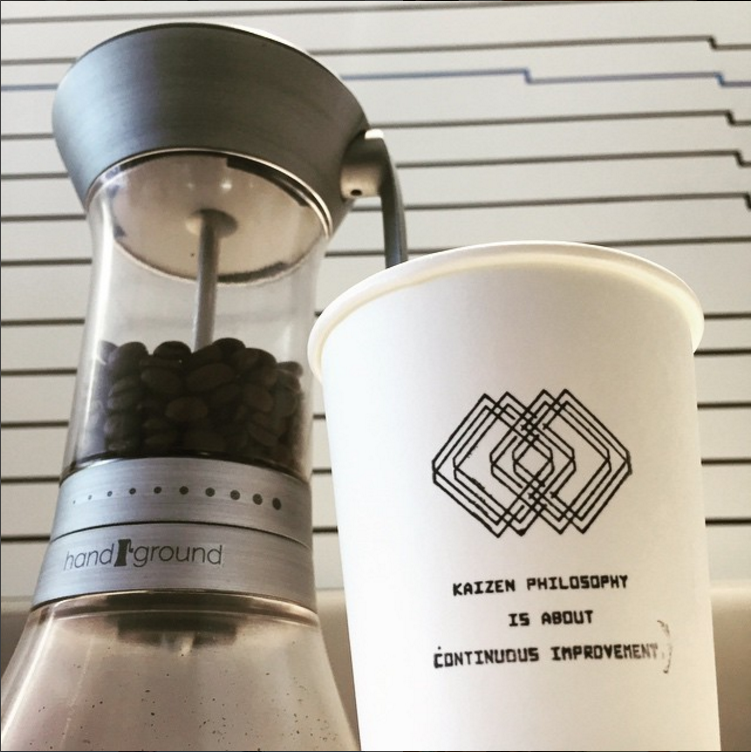 We loved the concept so much that we originally planned to name our company “Kaizen Coffee”. It was only after we conducted a survey to test our business name ideas that we learned Handground was easier to spell and had better associations. Gary was busy with work but he insisted we visit a café called Roots since it’s only open to the public on the weekends. The unassuming roastery lies behind a sliding glass door not far from the Ekkamai BTS (skytrain) stop. Binders of roasting logs and bins of roasted beans line the wall and a Giesen roaster sits among a handful of small tables on the main floor. Ake, a barista who helped develop the concept behind Roots, prepared coffee for Brandon and I while we sat at the dark hardwood coffee bar that spans the right side of the cafe. Varratt, the founder of Roots, joined us and over the next hour we heard the story of how the specialty coffee scene had developed in Bangkok since he founded his first cafe 8 years ago. Roots works directly with three farms that they selected as having the most potential to create quality coffee by providing them with fertilizer and education on soil nutrition. Varratt is a member of the Specialty Coffee Association of Thailand which just started in November 2014. SCATH has already attracted over 200 members and is holding competitions for the farmers following the same tasting standards outlined by the SCAA. Varratt’s personal philosophy of, “The simplest things are the hardest to make right” comes from his pursuit to always try to get to that perfect cup of coffee. Doing the simple things right is paying off; Roast plans to open a new commercial space by the end of this year that welcomes local producers to display their passion for individual pursuits, and a public garden with the hope to inspire people to build a different type of community. On the way out of Roots I spotted a glass jar by the sliding door that was stuffed with multi-colored currency. The sign on the jar read “Please pay at the Honesty Box. Feel free to pay more or less depending on satisfaction. Coffee: 100; baked goods: 50 baht.” Truly a representation of the relationship between the cafés and coffee community in Bangkok. A couple days later Gary was off work and ready to go coffee-shop hopping. I met him and his wife, Michelle, at Phils coffee and they recommended the Wild Honey blend. While our coffee was being brewed, Gary introduced me to the head roaster. He took us back to see his roasting machine and we started talking about importing beans. He explained that Thailand charges a 90% import tax for coffee beans in an effort to make local Thai coffee more attractive. The prices reflected the import tax on the menu. Wild Honey, which is grown in northern Thailand near Doi Chaang, was one third the price of coffee from Ethiopia and Panama. I took a sip and flavors of honey, apricot and vanilla greeted my taste buds. To Michelle and Gary, Bangkok is unlike any other coffee community in the world because the owners of the cafes are close friends and spend the evenings hanging out at one another's cafe, a feeling that they didn’t experience when living in the United States. For our last stop, we jumped onto the BTS and headed for Gallery Cafe, home of “Mr. Hand Grinder.” Gallery just reopened after a renovation to install a wavy honeycomb structure on the ceiling that was inspired by the ripples in a cup of coffee. Floor to ceiling shelves are filled with dozens of hand grinders that the owner, A, commonly referred to as Mr. Hand Grinder, had renovated in his spare time. Gary translated while I showed A the Handground prototype I had brought along, and although some words may have been lost in translation, “excited, happy and amazed” came through just fine. Our time in Thailand had gone by fast and it was already time to head back to Shanghai for the next production milestone of Handground. The specialty coffee scene is young but growing quickly. Farmers are working to improve their crops, new cafes are opening weekly, and there is a thriving community of people who are passionate about coffee. Although most coffee produced in Thailand is also consumed there, I won’t be surprised to see it at cafes around the world soon. As to whether the coffee scene is bigger in Bangkok or in Chiang Mai, I will let future travelers decide. What I can say is that the coffee culture in each city is rich and the communities are intimate. Whether you are entering the scene by opening a new coffee shop or just a traveler looking to talk about coffee, their arms are wide open to accept you into the community. I think that’s why I love coffee so much, because it touches the lives of so many people around the world; no matter where we are from or how different we are, coffee provides a common ground that we can relate.